Adapter to connect two (2) 1/4" Mono Male cables together. Adapter to connect two (2) male XLR microphone cables together. This 1/4" Female to 1/8" Male adapter is used as an adapter to go from 1/4" Stereo to 1/8" Stereo. This is a 1/4" mono to 1/8" stereo adapter. 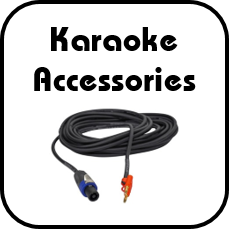 Use this to hook your regular karaoke microphones in to a PC or any other device that only take an 1/8" plug. This is the perfect adapter to replace your cheap computer mic with a real Karaoke microphone! Standard 1 5/8" microphone size black windscreen. Standard 1 5/8" microphone size gray windscreen. Standard 1 5/8" microphone size red windscreen. These windscreens fit over your microphone to reduce pops and wind noise. 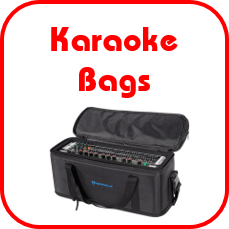 A must have item for the pro singer. These come as a package of five (5) in assorted colors. Screw on metal battery cap for the popular AS-890 dual wireless microphone set.